Matthew Tkachuk scored the go-ahead goal midway through the third period for Calgary, David Rittich made 34 saves, and the visiting Flames beat the Minnesota Wild 2-1 on Saturday afternoon. Once the rough stuff was out of the way, the Calgary Flames settled in and clamped down on the Minnesota Wild. "If we need goals we can get them, but more nights than not we want to play tight checking defensively and create our offence that way," Giordano said. "We know we can do it." Nine days after the Flames beat the Wild 2-0 in a tension-filled game in Calgary, both sides brought their grudges to the ice along with their sticks and skates. 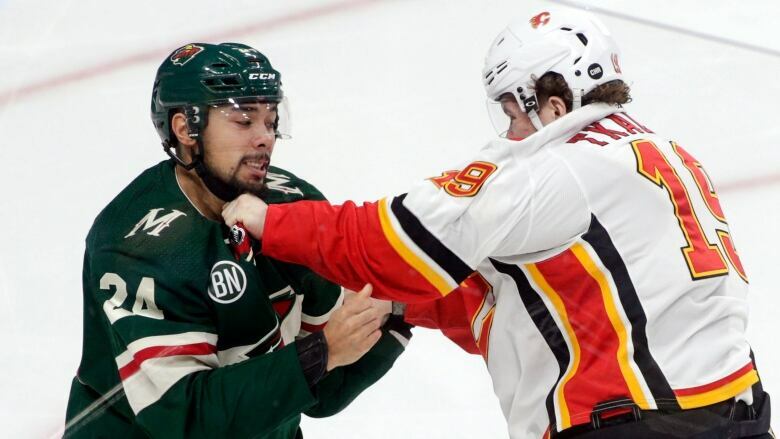 Forty seconds after the opening faceoff, Tkachuk fought Minnesota's Matt Dumba, who levelled Flames centre Mikael Backlund with an open-ice check in the final minute of the matchup on Dec. 6, when Dumba was retaliating for a knee-on-knee hit Wild captain Mikko Koivu took from Giordano earlier in that game. Giordano served a two-game suspension. Flames forward Ryan Lomberg was banned for one game for going after Dumba, which also triggered an automatic $10,000 US fine for Peters. Koivu (lower body) and Backlund (upper body) each missed their fourth straight game. Dumba, who leads NHL defencemen with 12 goals, didn't play in the last two periods. Coach Bruce Boudreau had no update afterward on his condition. After Dumba's power-play shot was blocked, the Flames went the other way for a 2-on-1 rush that set up the goal by Giordano . Shortly before the first intermission, Wild forward J.T. Brown fought with Flames defenceman T.J. Brodie. A little later, Wild defenceman Ryan Suter even dropped his gloves for a scuffle with Flames forward Sam Bennett. That was Suter's first fight, according to hockeyfights.com , since 2009.